A good gym in (or near) city of Albany? My gym is closing, Steuben Club, the only gym in a walkable neighborhood of Albany is shutting its doors this month. I'm looking for a good alternative, where I can easily get from my Center Square home, to my job at the capitol in the morning before work. Is this asking too much in Albany? What are the best gym choices for someone who lives and works downtown, and prefers to avoid strip malls? There are plenty of gym options, so maybe there's something to fit what Alison's looking for. Got a suggestion for her? Please share! I go to the Albany JCC. They have nice clean facilities, tons of classes including spin and yoga plus a very nice indoor pool and in the summer two outdoor pools (one specifically for small children). It's not walk-able from Center Square, but would be about a 10 min drive or nice bike ride. I ride from the DelSo all of the time, great warm up and cool down. It's $55/month for an individual. After the Y on Washington Ave closed I joined the JCC on Whitehall Rd.. Only sorry I didn't find it sooner. Lots of classes, equipment, well staffed and maintained and parking. A short bike ride from Center Square. Check it out. I believe the Empire State Plaza concourse has a Y branch. Not sure about hours - but I think they pretty much cater to state workers so I would think that would fit Alison's workout schedule. Omni Fitness 54 State street. 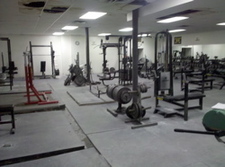 Nice clean facility good classes. I live in Center Square and work on Elk St downtown. I joined the North Albany YMCA. While it's not very big, it's also not very crowded in the AM, and it's fairly convenient to work out at before work. The traffic is not too bad in the AM coming back into downtown. There's also a Stewart's near the Y, so a convenient place to grab a cup of coffee on the way into work! The Y in the ESP closed over a year ago. What about Albany Strength on Central Ave? Thanks, Ron. I had a feeling that might have been the case but wasn't sure. So, in that case, I would just recommend walking up and down State Street a few times. That'll definitely get the heart rate up. :) It's in walking distance, obviously, and it'll save on a gym membership. Albany Strength is great. Very well equipped, friendly staff, and no contracts required. The North Albany Y is a diamond in the rough. I wish I was still downtown because it's a nice facility. I also love Albany Strength! Lot's of great machines (not cybex, they are the ones you rack), awesome rack/squat/bench room, tons of free weights, and a small cardio room. It depends on what you are looking for. Everyone there is very friendly and helpful and their hours/fees are great. Best Fitness on Central Ave, while in a strip mall, is a good value with nice, early hours for that pre-work workout. It's a 7 minute drive from my apt in Hudson/Park. I echo Caitlin's sentiment about Best Fitness. They have classes around the clock (if those are your thing) and it's dirt cheap--$20. so if you don't get there regularly you don't feel like you're wasting money. Yes it's in a strip mall but it's easy to get to and you can always do a quick shop at Price Chopper or Hannaford across the street if your schedule allows. Something more about Best Fitness: They plan to open another facility on Fuller Road in a month or two. Hopefully that will reduce the evening crowds at the Westgate location. Westgate could use another water fountain, or at least, one designed to fill up bottles faster! But that is my biggest complaint about the place. The facility in Niskayuna is nice, too.